For storing devices when not in use or being charged. The operating panel is still visible while the case is in the holder. The holder can be screwed to a wall or machine housing. 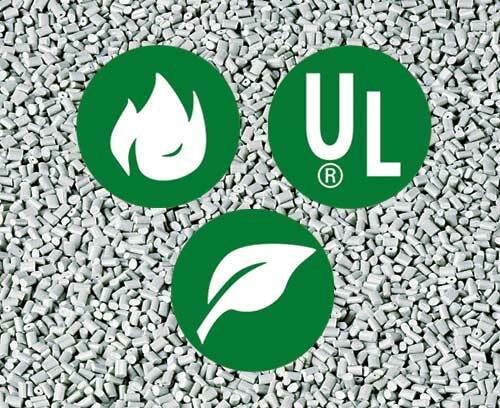 For other surface surfaces that cannot be drilled (furniture, glass panes etc.) it can be secured using an adhesive foil. Do you need to simultaneously charge several BODY-CASE enclosures on a table stand- perhaps by induction? No problem! Stations are now available as accessories for individual series mounting and configuration. The stations offer sufficient space for additional electronics, e.g. 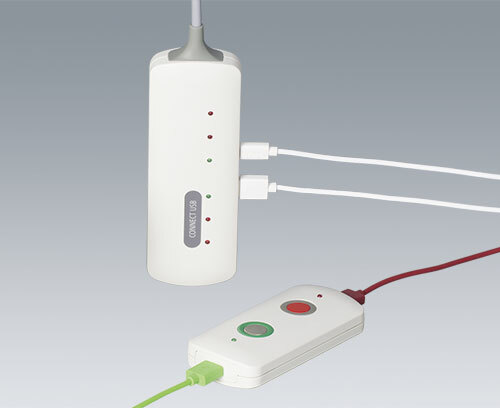 an inductive charger. Integrated guides allow the BODY-CASE enclosure to be easily located. 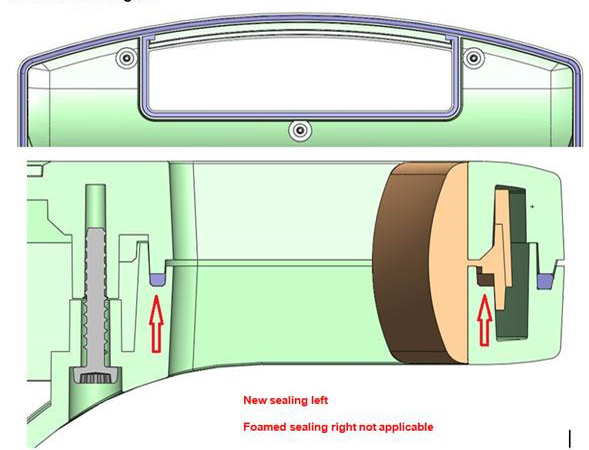 If necessary, a seal (accessory) for protection class IP 54 can be fitted. In the new issue of the INSIDE customer magazine we deal with the topic of "high quality, modern aluminium enclosures". 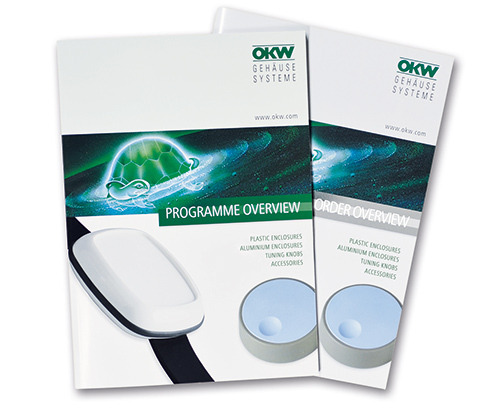 The OKW aluminium enclosure programme protects your electronics reliably. The enclosures offer an optimum combination of function and design. They score points with exceptional stability and heat dissipation, as well as a high-quality appearance thanks to a matt anodised finish in conjunction with attractive plastic parts. 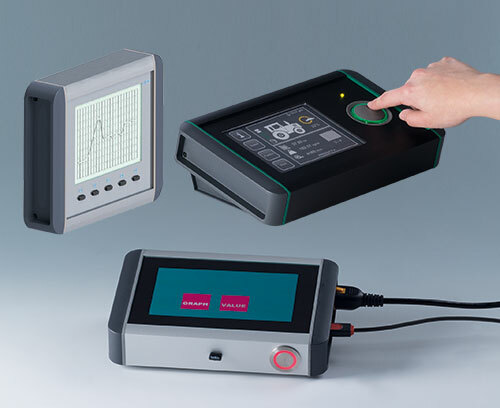 A new embedded systems version of our sophisticated SMART-TERMINAL enclosures is now available. These enclosures have flat anodized front panels instead of the molded end covers and seals. 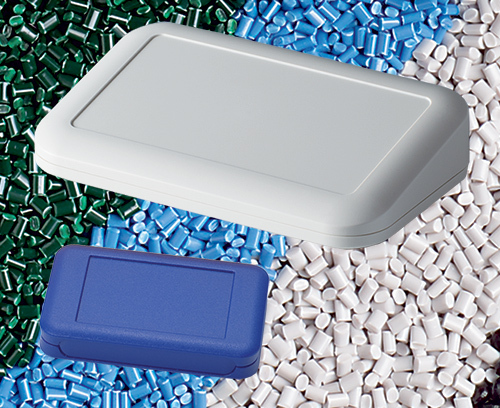 Our new SMART-TERMINAL extruded aluminum enclosures feature a highly quality matt anodized finish. These robust, elegant and highly attractive cases offer plenty of space for large-volume electronic assemblies, for example touch screens, display modules, PCBs etc. 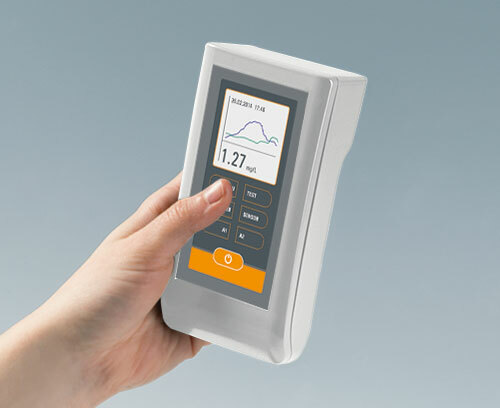 A variety of technical advantages, individual profile lengths on request, and creative designer options make the SMART-TERMINAL the last word in excellence for tough industrial display enclosures. STYLE-CASE is now available in two new sizes: "S" (4.88" x 1.88" x .98") and "M" (5.78" x 2.20" x 1.06"). 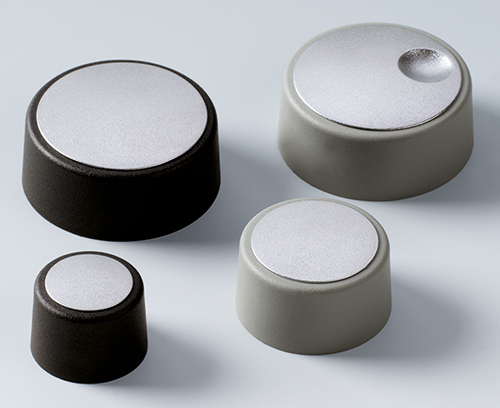 The compact sizes and comfortable feel make these ideal for design-oriented electronics of all kinds. The gloss finish gives the device a very modern appearance. As far as the finishes are concerned, you can choose between black and traffic white. On request we can also supply different colors. For the power supply, the enclosure sizes S and M are equipped with an externally accessible battery compartment for 2 x 1.5 V AAA batteries. 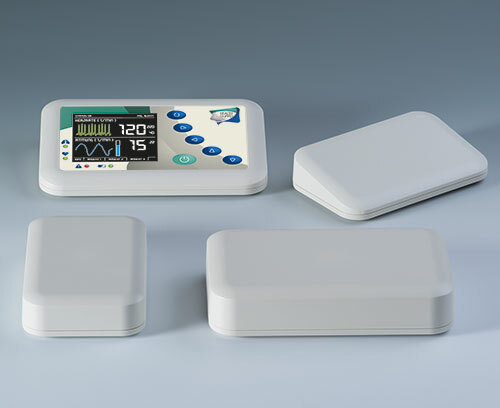 BODY-CASE enclosures can now be developed into even smaller units with the launch of the new smaller size "M" models. With external dimensions of only 1.96" x 1.61" x 0.62". Wrist strap, belt / pocket kit, lanyard etc. are available as accessories. In addition, two "stations" for the housing sizes L and M are now available as accessories. They provide sufficient space for additional electronics, e.g. 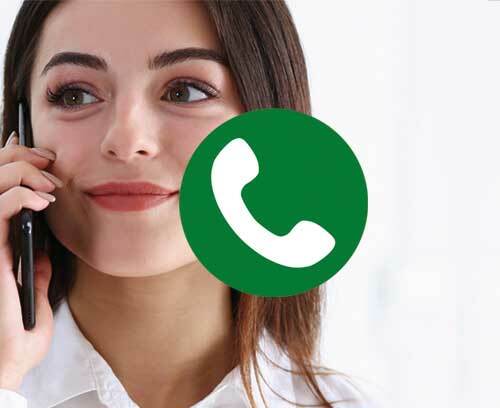 for inductive charging. On request, the stations can be mounted in series. 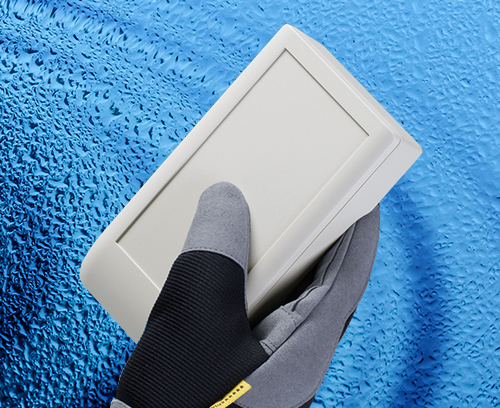 EVOTEC 250, with outside dimensions 9.84" x 6.10" x 2.12" has been added to the EVOTEC range of modern, tough, UV-stable and IP 65 sealed desktop enclosures. 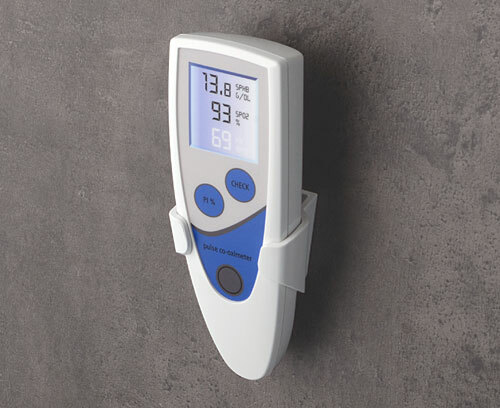 The new size offers sufficient space for the installation of a 5.7" display with/without touch screen functionality. 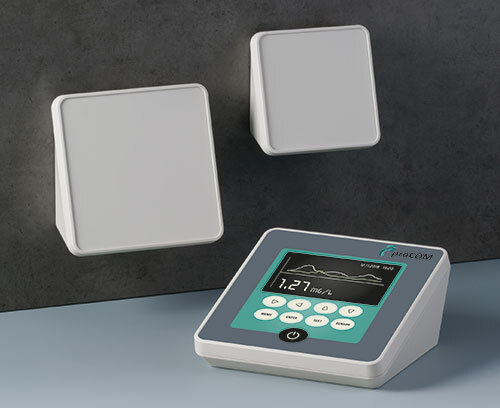 The new EVOTEC enclosures expand our range of robust table top enclosures with a modern design concept. Soft contours guarantee an elegant appearance and ensure high-quality packaging of your electronics. The enclosures are made of UV-stable ASA+PC-FR plastic material, and can be ordered with a seal for protection class IP 65. 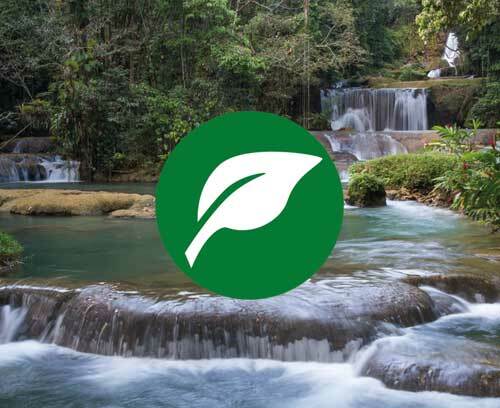 Your equipment is thus fully prepared for rough conditions and outdoor use. 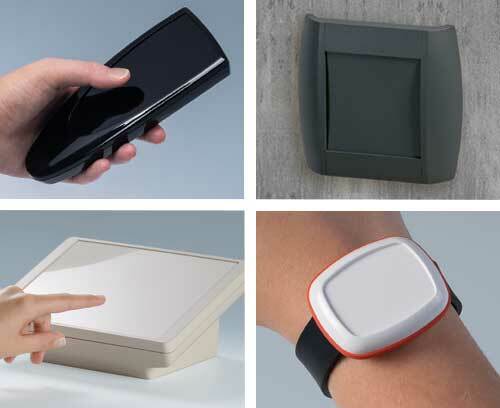 The enclosures are available with different top parts to suit different applications. There is the classic rectangular version with flat top part and large interior, or the sloping top version which has a 12° ergonomically inclined front panel – ideal for desktop applications with perfect user comfort. 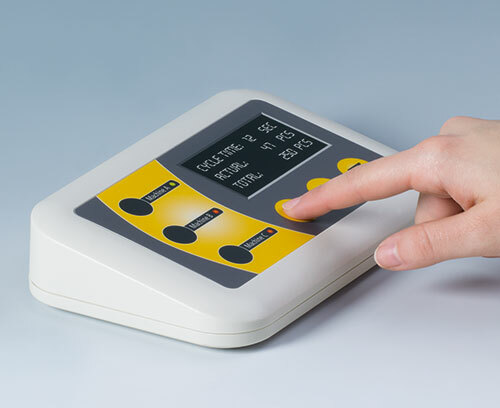 The desktop version is also available with or without a recessed area in the top for fitting a membrane keypad / product label. Ask us to send you a sample - add them to your basket! 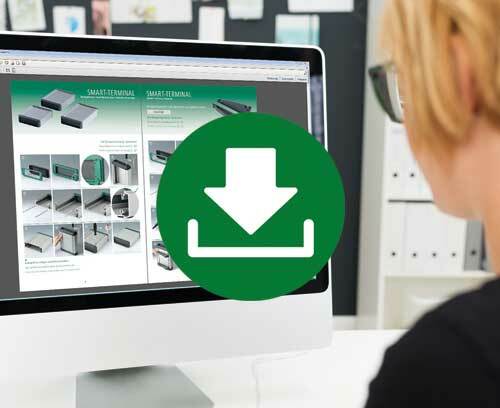 New versions are now available for applications requiring a larger installation compartment, to supplement the RAILTEC B range of DIN rail enclosures. The top parts of the enclosures have different connection levels, high and low, for mounting individual components, e.g. terminal blocks, plug headers, front connectors, USB, LAN and D-Sub connectors. The enclosures meet the requirements of DIN 43880, size 1, and guarantee fast and simple locking capability onto standard rails complying with DIN EN 60715 TH35. 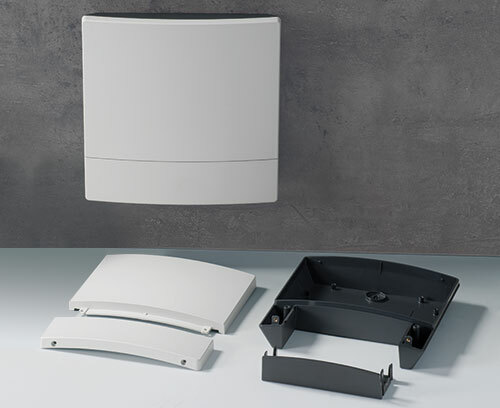 With small enclosure applications, external wall mounting brackets/kits can often be intrusive and visually unattractive, especially for high value applications. 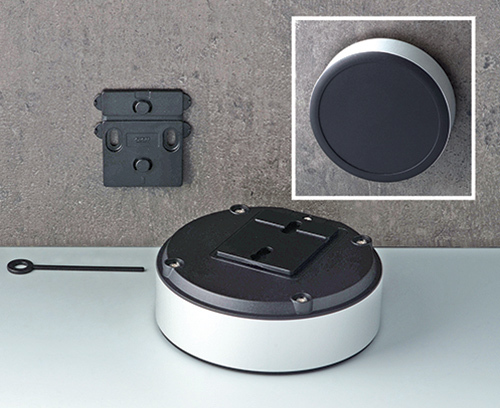 So, concealed wall mounting is often a sought-after solution. 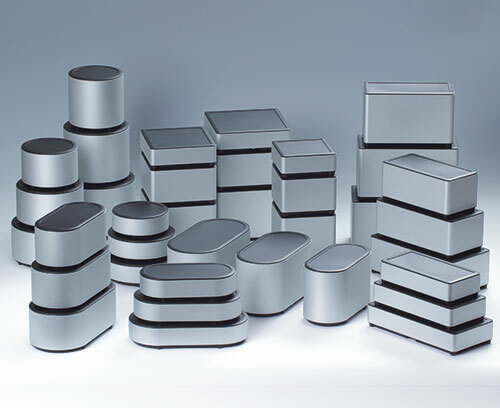 SYNERGY R140 (ø 5.51" x 1.57" – ER143059) enclosures. 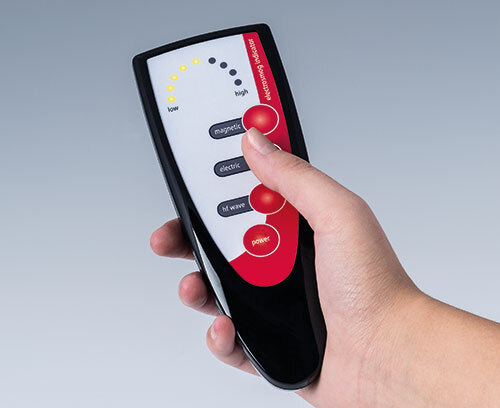 Our new STYLE-CASE has a high gloss surface finish, thus creating another design highlight for handheld control units. Available from January 2017 - these elegant eye-catching enclosures fit snugly in the hand and are easy and reliable to operate. The highly polished surface has a very pleasant feel which imparts a high quality and modern user experience. 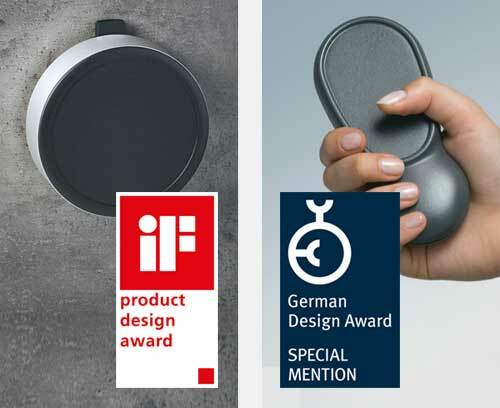 We have updated the sealing design in the handle area of the Carrytec M (slim) and L models to improve the performance of the IP 54 protection. 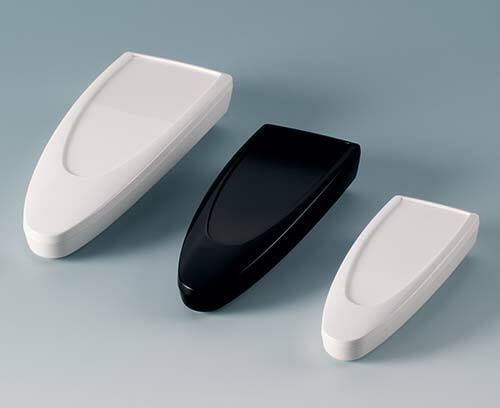 New highly attractive feet kits for fitting to any type of plastic or metal enclosures. Very modern and tough design molded in ABS with anti-skid pads in TPE. Four standard colors. Available with or without tilt feet. 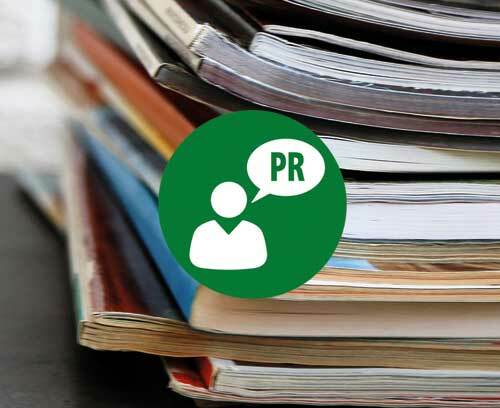 The all new OKW catalog differs from its predecessors. 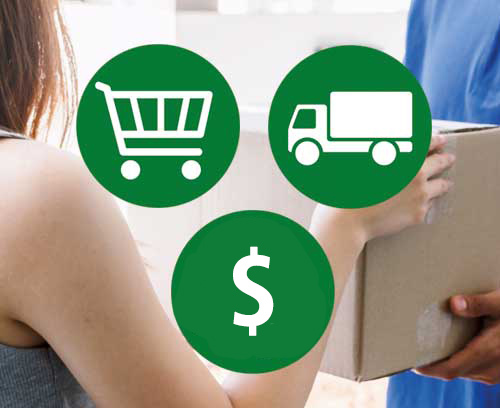 For the first time there are two separate sections, the overview section which highlights the main features of each product range, and the ordering information section with provides all of the ordering data. 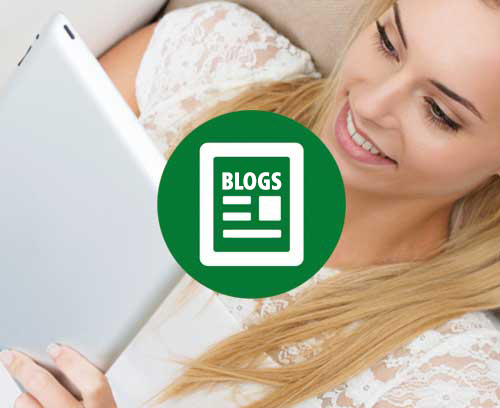 All the new products and product enhancements introduced since the last catalog are now included. New lower priced versions of our tough DATEC-COMPACT enclosures are now available. 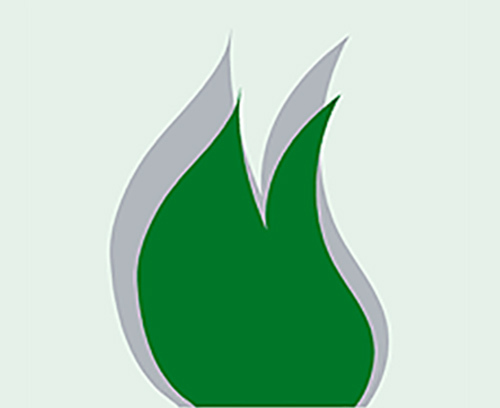 These are supplied without integrated sealing gaskets. Three sizes (S, M, L) and two standard colors off-white (RAL 9002) and lava are available. 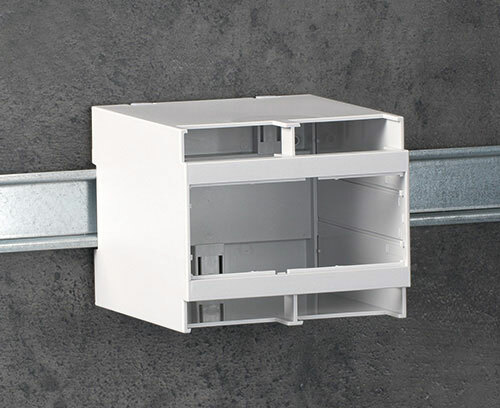 New DIN rail enclosures in PC (UL 94 V-0) with high top part for extra space inside. Terminal guards as accessories. With open and closed front panels. Front panel and front cover available as accessories. 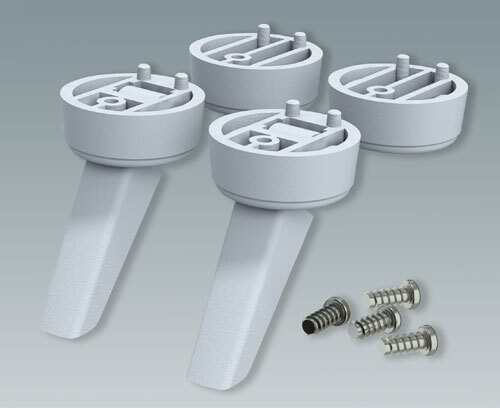 Suitable for EN 50 60715 DIN rails as well as for direct wall mounting. 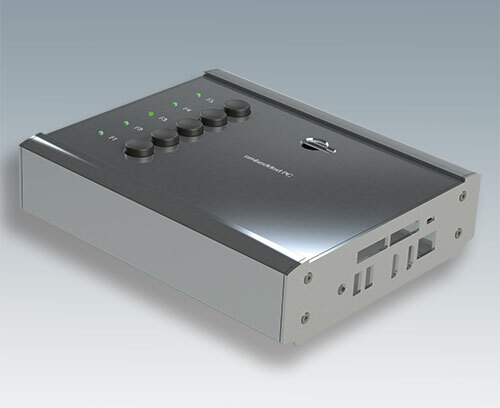 New compact DIN rail enclosure with push-on terminal blocks, 16-pin (4 x 4 pins) in a 5 mm grid. Versions without/with ventilation slots for good heat dissipation. Suitable for DIN rails EN 60715 TH35. 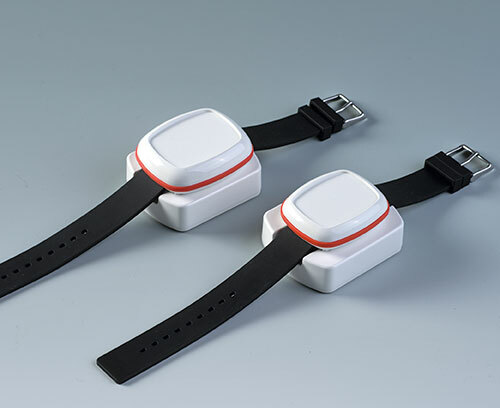 BODY-CASE is the new "wearable" standard enclosure from OKW. 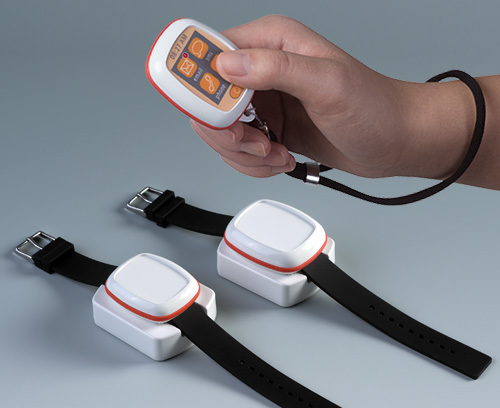 The design is perfect for so-called "wearable technologies": on your arm, around your neck on a lanyard, clipped to a shirt or trouser pocket, or carried loose in an article of clothing. 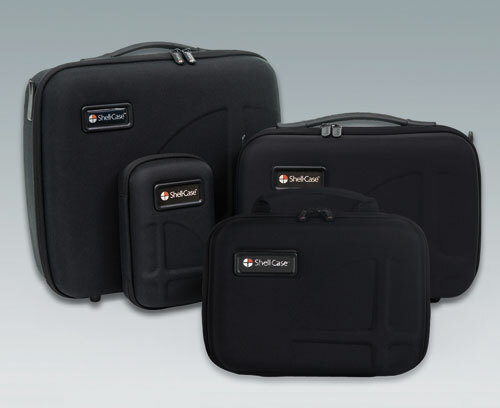 Our new Carry Cases have a modern design and offer reliable protection for your valuable electronics equipment and accessories. The Carry Case series is available in four different sizes and features modular components which allow individual partitioning of the case interior. 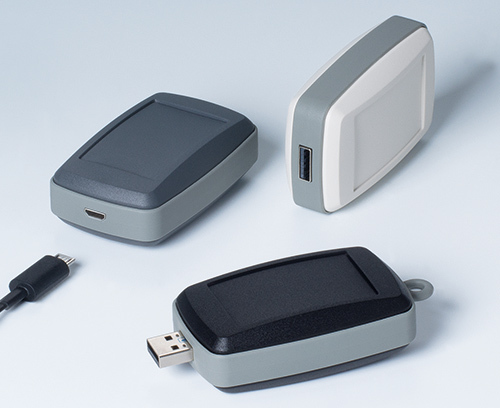 CONNECT is a new range of versatile and compact plastic enclosures for wired applications. The cases are offered in three sizes and consist of two case shells which are easily and reliably snapped together. Either end can be fitted with the accessory cable glands or plastic end panels which can be machined for USB connectors etc. 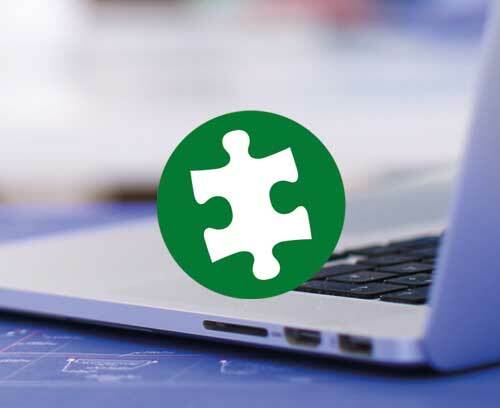 Applications will include medical, peripherals, building services, measuring and remote controls. Ask for a sample today! For keeping instruments, sensors, accessories etc. 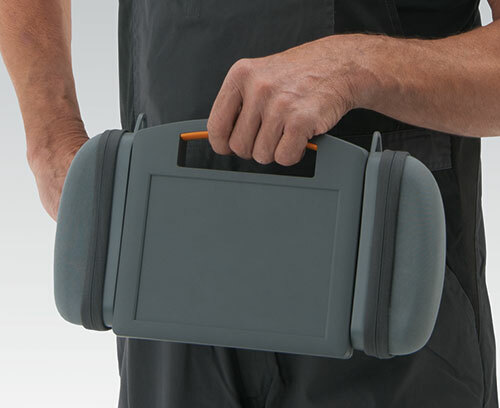 there are now also special side carrying cases (molded plastic parts and textile fabric) for the size M Carrytec enclosures. 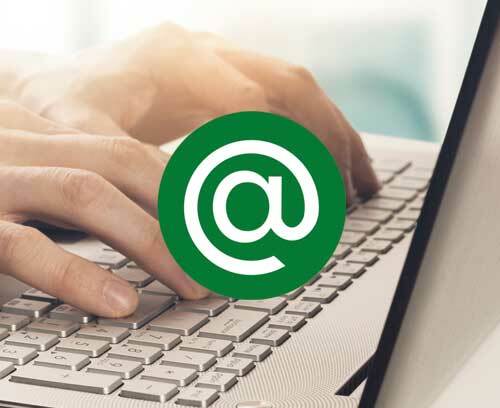 Interfaces can be pre-connected and are immediately ready for use. Sold as complete sets. 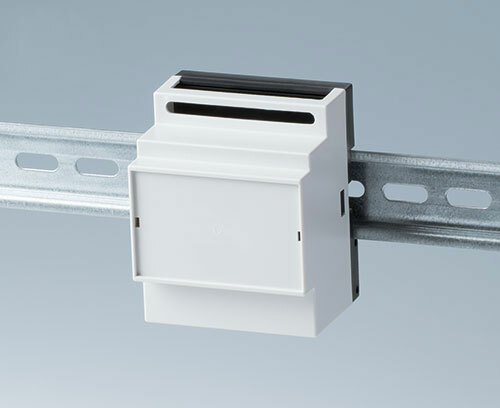 New cover for KNX connectors fits to the 2/4 module RAILTEC B series models - version VI as well as with flat top models. Easy assembly through snap-in installation of the case parts. The robust and highly attractive SMART-BOX series is now available in a useful new size: 8.66" x 5.11" x 2.36". 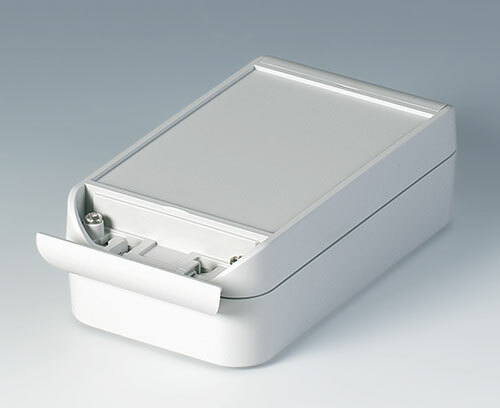 These IP 66 rated plastic enclosures is made of high-quality ASA+PC-FR (UL 94 V-0) in light gray RAL 7035. The modern design includes many useful design features including hinged trims which hide all of the assembly screws. 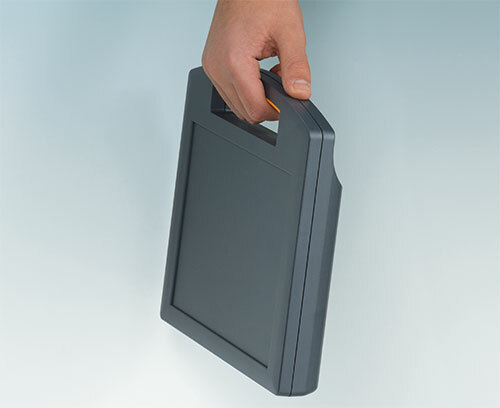 Carrytec size M enclosures are now also available as slim versions for the installation of tablet style electronics and the like, which have less space requirements. The practical handle also makes it possible to carry the enclosure comfortably and securely. 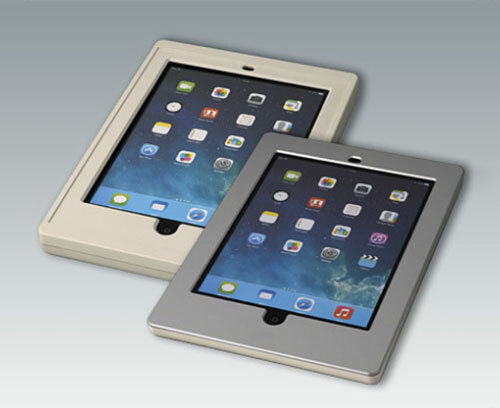 OKW has added two new iPAD Air front panels to its INTERFACE-TERMINAL multifunction electronic enclosures range – enabling the tablets to be securely mounted to walls or desks, or in a robust handheld enclosure to help prevent damage or even theft. 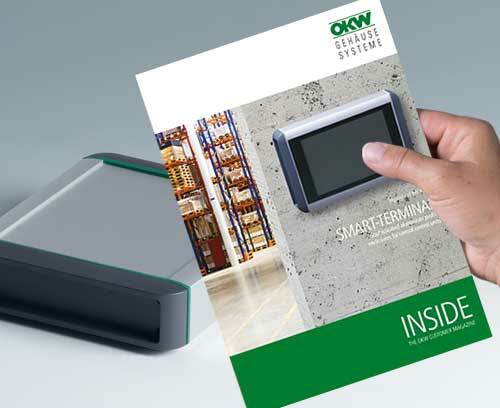 For the first time ever, OKW has combined aluminum with plastic to produce a harmonious blend of materials in its advanced new range of enclosures. 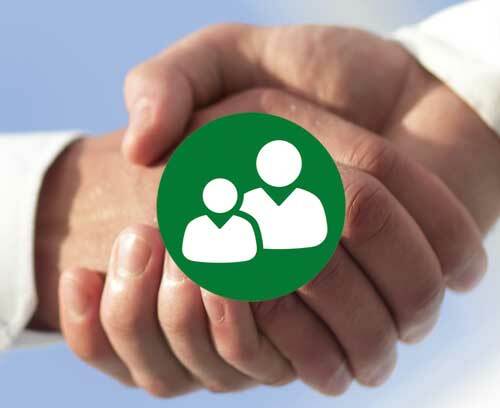 Synergy is available in 36 different models from launch. These beautiful new housings feature an extruded aluminum case profile, which has a very high quality surface finish. The plastic top and base parts are assembled by internal fixing pillars. The top is recessed for a keypad and the base includes a battery compartment lid. 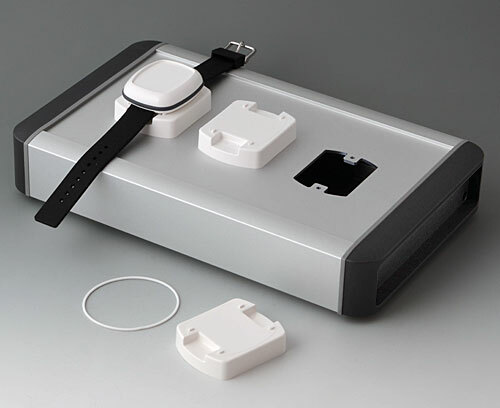 Separate battery cradles for 2, 3, or 5 AA cells are available. The base is inset for fitting cables up to ø0.12" (ø3 mm) through the underside. 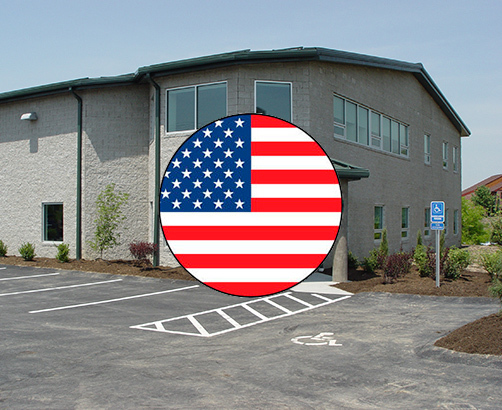 Four case shapes are offered; round, square, rectangular and oval. The plastic parts are flame retardant (UL 94 V-0) and UV stable. A wall mounting kit is also offered. Synergy enclosures can be supplied fully customized. Different heights can also be accommodated. DATEC-COMPACT is our latest range of modern and ergonomic handheld enclosures which have been designed for tough outdoor applications. The material is ASA + PC-FR (UL 94 V-0) which is strong, flame retardent and resistant to ultraviolet radiation when frequently used outdoors. DATEC-COMPACT cases are available in two standard colors: off-white, RAL 9002 and lava gray. 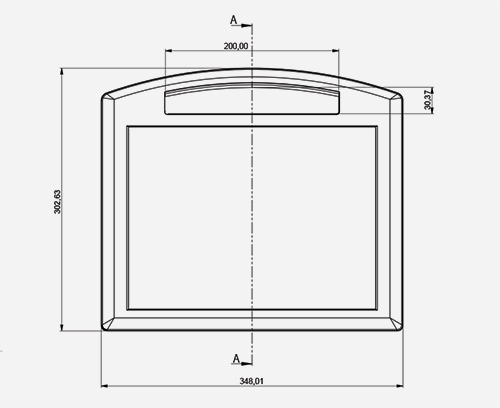 All models are a supplied with a pre-molded IP 65 (NEMA 4)sealing gasket in the lid. Options include a 3 x 1.5V AA battery compartment, desk charging station, pre-fitted contacts for the station and wall holders. The launch model is size M (6.77" x 3.62" x 1.53"), sizes S and L will be available later in 2014. 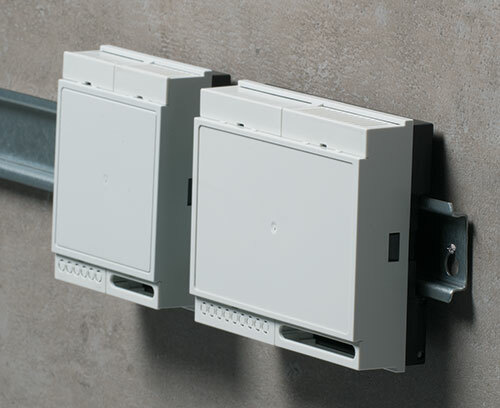 The new RAILTEC B low profile DIN rail enclosures have a flat full size top sections which is ideal for mounting controls and displays. The top section is recessed for fitting membrane keypads or product labels. Internal mounting pillars are provided inside the for mounting displays and PCBs. 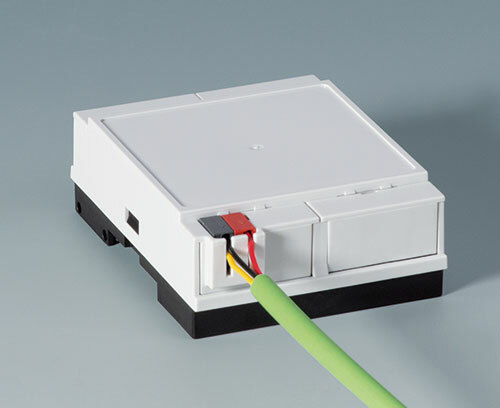 PCB terminal blocks and headers can be accomodated in the ends, and a range of terminal guards is available to suit different pitch sizes and arrangements. These new low profile models are available in standard widths of 2, 4, 6 and 9 modules. 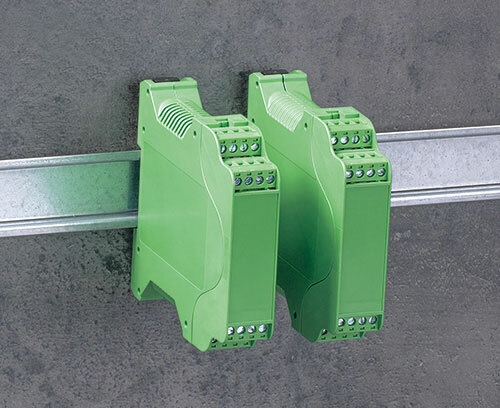 The DIN rail clip on the rear conforms to DIN EN 60715 TH35. 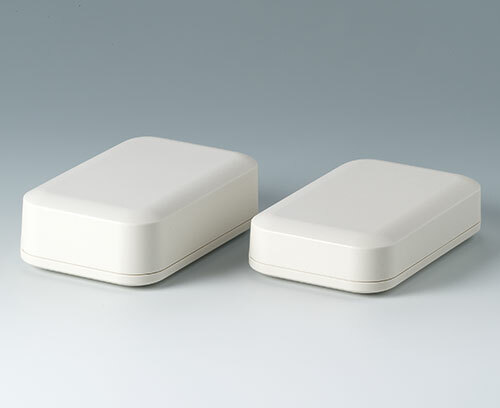 The enclosures are molded in flame retardant UL 94 V-0 rated PC and PPO. 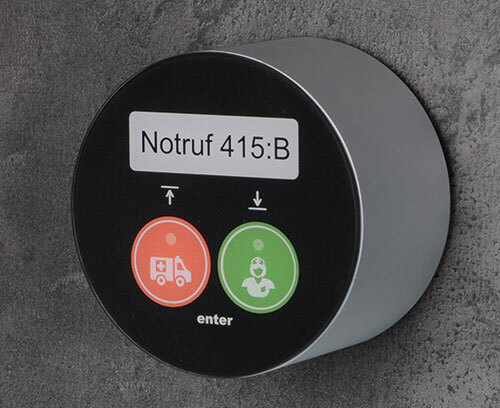 Very modern and elegant housings for wall mounted control units, network nodes, medical devices, access control terminals and much more. Stylish curved top section which can be fitted with LEDs, displays and switches. Inset panel on the underside provides discreet mounting for all the connections i.e. RJ45, RS232, HDMI, USB, power inlets etc. The connectors and cables are hidden under the front lid.